Does anyone know where this tug is now? I received a lovely PM from a new member who's father-in-law worked on it for 50 years, and has a birthday and aniversary coming up soon. Send a PM to George--other Model Tugman. He will probably know or will know who does. 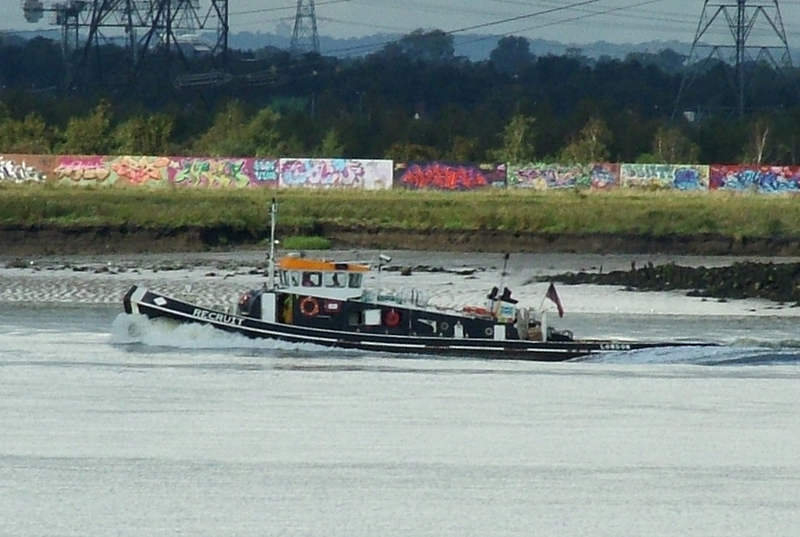 If this tug is not available for viewing up close, is there another tug around London that is? Built 1952 by Richard Dunston Ltd., Thorne. L80’. B19.6’. D9.6’. 91grt. 670bhp Crossley diesel engine. ON184630. 1952 Delivered to Cory Tank Lighterage Ltd., London. 1983 Transferred to Cory Waste Management Ltd., London. 1990 Transferred to Cory Environmental Ltd., London. 1996 Re-engined 1196bhp Mirlees-Blackstone ESL Diesel. 2011 Sold to Thameside Services, 10, Milton Place, Gravesend, Kent. 2012 Still in service. IF IT DONT FLOAT...TOW IT UNTIL IT DOES!!!! The young lady (and forum member) who orginaly PM'd me the request for info on this tug sent me another PM as follows, and I think she's correct in her opinion, so I'll share it with you all. Forgot to mention and you're probably aware but just in case you didn't, during the Second World War, the Recruit, Regain, General VII et al all worked for Cory going up and down the Thames, pulling barges of rubbish, delivering fruit etc and during the Battle of Britain when London was bombed, they still went up and down the Thames - bombs going off left right and centre around them. And we worry about sitting in traffic jams! And they all got Merchant Navy rations unlike everyone else. I think it's terribly sad that over the last few years when the media have thanked the world and his mother for their services to the war effort, those individuals who served on the Thames have been ignored for their services.
" A newbie to this site - as you can tell! Are you aware of anyone building a tug called The Recruit? My father-in-law served as the tug engineer on the Recruit for 50 years. He will be 90 this Sunday and although he has is aware that a replica was built and shown in Hall Place, Bexleyheath, they can no longer find it. Whilst it is too late to do something for this weekend, I have time as it is also his 70th Wedding Anniversary in August. Any ideas??" 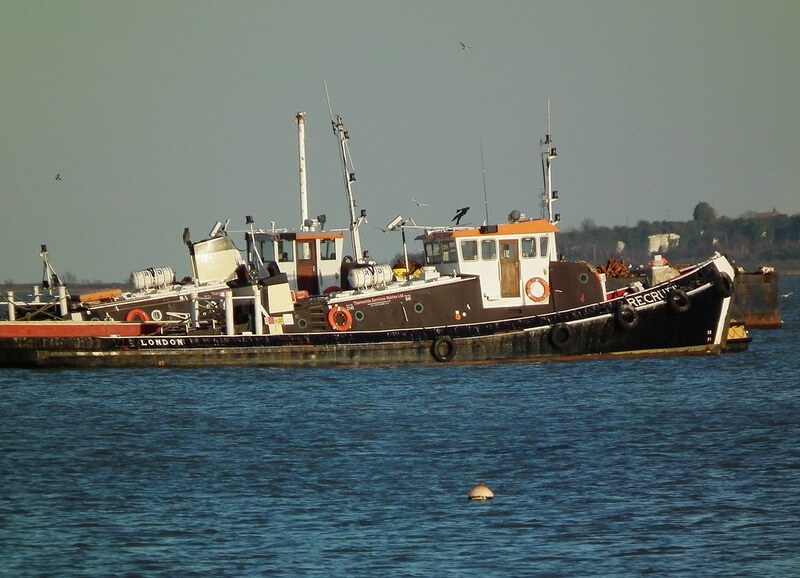 I think the recruit that is in question might be the original steam powered tug, details below from the Thames tug site. Built 1901 by Stothert Ltd., Bristol. L69’. B17’. D8.5’. 59grt. 19nhp 2cyl compound steam engine by builder. ON112850. 1901 Delivered to William Cory and Son Ltd., London. 1934 Owners Cory Lighterage Ltd., London. 1934 Scrapped. Since my last communication last night I received some sad news. Thameside Services contacted to advise that The Recruit(2), the Tug my father in law who supervised the build in Yorkshire Thorne, Yorkshire, who served on her as the Tug engineer through the Second World war and for a total of 50 years, who had the pleasure of being part of the New Year's celebrations on the Thames, took part in the VE celebrations, was sold by Cory in 2011 to Thameside Services has been scrapped after colliding with a ship. To say that I am upset is an understatement. Upset because I shan't see her going up the Thames during my lunch break. Upset for my father in law who ĺovingly polished her until his face shone in the brass and upset with Cory for not letting me buy her because if they had, she wouldn't have been given to a company who didn't love her like we did. Since my rather upsetting post, I have been digging around and from being terribly upset to elated in a couple of hours is a bit of a shock!! I've spoken to GPS Marine to see if I can arrange a visit for my father-in-law and awaiting a call. This is what I originally wanted from Thameside Services when he turned 90 and he is now 92. As an aside, I am a little confused by her history. Albert Hurd (my father in law, fondly called Poples) supervised her build in Thorne, Yorkshire in 1934 yet previous posts suggest she was scrapped in 1934 and the Recruit (2) was built in 1952 which can't be right. I know she has had a couple of engines replaced and at one point had a steam engine in her but that wouldn't make her 'scrapped' - would it? A rather confused yet happy girl! Hello Angela, it is a little confusing about the build years of the Recruit, as the only tug that Cory had built in 1934 at Thorne was a tug called the Reserve. Built 1934 by Henry Scarr Ltd., Hessle. L74.7’. B19.3’. D9.6’. 82grt. 530ihp 3cylTE steam engine by Plenty and Son Ltd, Newbury. ON163536. 1934 Delivered to William Cory. 1952 Delivered to Cory Tank Lighterage Ltd., London. 1983 Transferred to Cory Waste Management Ltd., London. 1990 Transferred to Cory Environmental Ltd., London. 1996 Re-engined 1196bhp Mirlees-Blackstone ESL Diesel. 2006 Still in service. 2011 Sold to Thameside Services, London. this will probably confuse you even more, so perhaps your dad stood by the Reserve in 1934 but went into the recruit when the Reserve was scrapped.